What do you most want to know about gum disease? Find your answer here. Periodontal disease, also known as periodontitis, is commonly misunderstood. In this blog, we explain how periodontitis develops, how it’s fundamentally different from cavities, and how it can be prevented and treated. Q: How is Periodontitis related to Gingivitis? A: Periodontitis is the most advanced form of gingivitis. If you experience gum bleeding, have observed stages of gum recession, and have tender or red gums, you very likely have gingivitis. Gingivitis is an inflammation of the gums caused by the presence of certain “bad” bacteria. When left untreated, gingivitis can advance into periodontitis, which is much more dangerous. 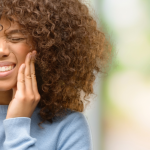 Most people who get gingivitis won’t see it progress to advanced gum disease, because preventative measures go a long way towards avoiding further complications. Early treatment is the best way to keep gingivitis under control so that it doesn’t develop into periodontal disease. Q: Why do people get gingivitis? 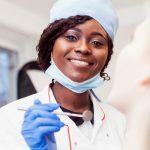 Am I at greater risk for gingivitis if I have cavities already? A: Typically, we think about the mouth as if it were a static environment, but that’s far from the truth. The mouth is actually a breeding ground for bacteria, and bacterial communities are constantly vying for territory. In a manner of speaking, your oral health depends on the dominance of the good bacteria over the bad. When the balance shifts to favor the bad bacteria, that’s when you see different types of oral problems. In the case of cavities, the most common bacteria involved are Streptococcus mutans, Streptococcus sobrinus, and lactobacilli. As food breaks down in your mouth, the PH level rises, creating favorable conditions for these cavity-causing bacteria. They feed on the decomposing food in your mouth and excrete an acid as a by-product. That acid is the guilty party responsible for wearing down your enamel, resulting in cavity formation. Periodontitis, meanwhile, is caused by different bacteria. That’s why people who suffer from cavities won’t necessarily have gum disease as well. People get gingivitis when dental plaque builds up. You may be unaware that the dental plaque itself is bacteria, clumped together in a community. 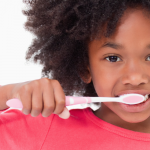 The only way to prevent periodontal disease is to disrupt these communities through cleaning. People with gingivitis need more frequent cleanings at the dentist to prevent plaque buildup because their mouths are already vulnerable. Once the gingivitis is under control, we recommend biannual dental cleanings in addition to your regular dental hygiene at home. Q: What are common periodontal disease symptoms? What does the disease look like at each stage? A: Periodontal disease generally progresses in episodes. The disease develops because of your body’s natural immune system reaction to the presence of periodontal bacteria. The immune system recognizes and tries to destroy any substance containing an antigen, such as bacteria. Whenever the tissues are injured by bacteria, the damaged cells release chemicals that cause the blood vessels to leak fluid into the tissues, causing inflammation. This helps to isolate the foreign invader from further contact with body tissues. In gum disease, the bacteria’s unwelcome presence in your mouth stimulates a continuous state of inflammation. To protect itself from the bacteria, the gum tissue (and eventually, the jawbone) recedes. Gum recession opens small gaps or “pockets” between the teeth and gums. When these gaps get bigger than a few millimeters deep, the bacteria can set up shop there, which further extends their reach into the periodontal tissue. They may destroy the periodontium and jawbone, loosening the teeth. If the disease gets worse, the teeth may fall out or need to be removed. Periodontitis is the most common culprit of tooth loss among adults. Q: Is gum loss permanent? 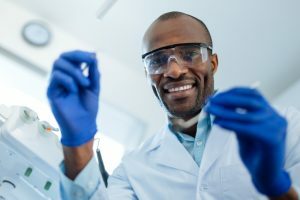 Can advanced periodontal disease be reversed? A: Unfortunately yes, gum loss is permanent. There is no way to grow the gum back. However, periodontists do offer certain reconstructive surgeries, such as gum grafting, which are highly effective in repairing the damage caused by gum disease. The good news is that advanced periodontal disease can be reversed through proper treatment by a periodontist. This will likely involve several in-depth cleanings to disrupt the bacterial plaque inflaming the periodontal tissue. Lifestyle changes can be another crucial component in addressing the disease. Saliva plays an important role in washing away bacteria from your teeth and gums, so you should keep your mouth moist by drinking plenty of water and eat foods that stimulate saliva. Eating nutrient-rich foods is another way to boost your immune system and slow the disease’s progression. You can talk to your dentist about the measures most appropriate for your case. Also, if you smoke, the most important thing you can do to reverse periodontitis is to quit. Periodontitis advances much more quickly in smokers as compared to other patients. Every case of periodontitis disease needs to be evaluated individually. You may have a minor case of gingivitis that never develops into the full-blown disease. Or, you might have a gum disease that has progressed to the point that it’s affecting other body systems (studies show that gum disease is related to both diabetes and heart disease.) The key is to see a dentist in a timely fashion so that you can get evaluated, and take appropriate measures to counteract it. 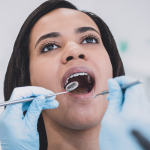 We encourage you to take advantage of the institutional knowledge and cutting-edge research on gum disease at the University of Pennsylvania School of Dental Medicine by receiving your care at our dental school care for a reduced rate. To schedule an appointment with a Penn Dental Medicine periodontist, please call our offices at 215-898-8965 today.